Vice-Admiral Onigumo (オニグモ中将, Onigumo Chūjō) was one of the five vice-admirals leading the Buster Call on Enies Lobby. He is a tall man with a scary-looking face and his eyes are always closed. He smokes a cigarette and wears an ancient war helmet. From under the helmet, a bunch of long hair is shown. When a soldier argued against Onigumo's order of destroying a fellow Buster Call ship and 1000 comrades just to kill Monkey D. Luffy, being a firm believer in Absolute Justice, Onigumo shot him in cold blood. Being a firm believer of Absolute Justice, Onigumo is willing to sacrifice anything to defeat what is defined as "evil". 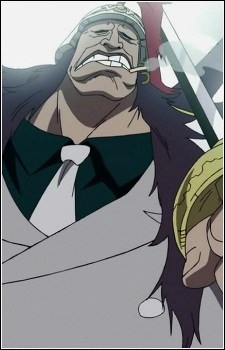 As a Marine Vice-Admiral, Onigumo is capable of commanding a Buster Call alongside four other Vice-Admirals. He also used a flintlock to shoot a soldier for questioning the doctrine of "Absolute Justice".